Competence to Operate Construction Plan - CPA will show on screen for download and we will email you a copy. 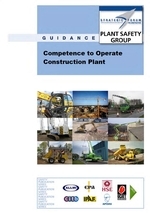 The guide, ‘Competence to Operate Construction Plant’ was produced with the backing of the Strategic Forum Plant Safety Group. The Health and Safety Executive (HSE) and Construction Industry Training Board (CITB) were also involved in its production. sets out a four-stage process for managing operators’ competence: selection, training and assessment, developing competence and life-long learning.